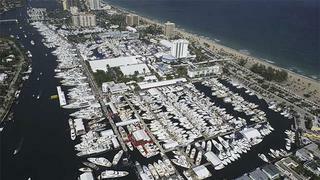 Boat shows  such the annual show in Fort Lauderdale, Florida  showcase hundreds of vessels, so preparation is required. Choices an owner who is selling their yacht makes at a boat show can hinder the sale or help close the deal. ‘During a boat show, there is an opportunity to bring more potential buyers aboard in four or five days than there may be in the next 360, so you want to bring as much positive attention to your boat as possible,’ says Cromwell Littlejohn, a yacht broker with Merle Wood & Associates, Florida. Adding a yacht to the playbill for a boat show can be a major expense. To get maximum benefit, a savvy seller will follow these broker-recommended tips. Some of the most important preparations for making your boat really stand out will happen well in advance of the show. The experts agree that it all starts with having your boat looking its best and having all the pieces in place to expedite the process should a buyer wish to move forward with purchase negotiations. ‘Repairs should be finished and everything aboard the boat should be detailed. The boat should be dressed like it is receiving a charter on board with all the yacht’s tenders, toys and amenities on full display,’ says Littlejohn. As a yacht owner, you already know that your crew is one of your yacht’s best amenities. Planning trips or charters that run too close to the boat show could have negative consequences. Not only do you want your crew to have the boat at its best, the crew themselves remain a powerful reflection and important feature of the yacht. ‘The crew should be rested and well prepared before the show begins,’ says Littlejohn. ‘In addition to having the yacht and crew in show-ready condition, I advise clients to hold an open house just prior to the show for brokers,’ says Crispin Baynes, a yacht broker with Burgess Yachts. ‘This way brokers can short-list the yacht when they have clients at the show. A pre-show open house is also a perfect time for the listing broker and captain to get the crew ready. ‘I can’t overstate the importance of having the crew properly briefed and show-ready,’ Baynes elaborates. ‘The broker and captain should hold a crew meeting at the start of the show to explain the dynamics of the show, what is expected of the crew, walk the tour path through the yacht and run through the boat’s selling points and key questions they can expect.